ITM Coal manages five mining companies with nine operating open pits situated on the island of Borneo in the provinces of East Kalimantan and South Kalimantan in Indonesia. The mining operations are generally divided into three groups (Bontang, Melak and Jorong), each with their own ports. The main export terminal is at Bontang Port with Bunyat and Embalut barge ports feeding coal from the Trubaindo, Bharinto and Embulat mines. Coal from Bunyut and Embalut barge ports can also be loaded at offshore trans-shipment export locations and does not have to be sent to Botang Port for this purpose. The Jorong mine and port, the only mine situated in South Kalimantan, supplies the domestic market of Indonesia. With nine operations and multiple ports, ITM Coal has a complex logistics and blending network. As with most thermal coal operations; moisture, Calorific Value (CV) and Sulphur were key requirements in defining acceptable product specifications. Defining and implementing controls around these were critical to successful outcomes. At the request of Banpu Public Company Limited (ITM’s parent company), Whittle Consulting was engaged to undertake a Whittle Enterprise Optimisation study, (EO) and strategic life of mine optimisations on the nine ITM coal mining operations in Indonesia. In addition, Whittle Consulting prepared three marketing scenarios and two business improvement scenarios, in consultation with ITM. The first step involved Whittle Consulting working with ITM Coal personnel to define a base case from existing mine plans and financial models. Whittle Consulting then generated a business model with updated economic assumptions on price, cost and discount rates to account for the time that had elapsed since ITM Coal’s previous business case. 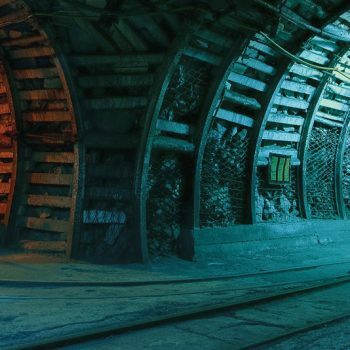 Using existing ITM pit designs and phasing, advanced analytical techniques and proprietary Whittle Enterprise Optimisation software (Prober-E), ITM Coal and Whittle Consulting models were aligned, creating a detailed updated base case. During the analysis, Whittle Consulting examined coal pricing mechanisms. Although coal product types and specifications were received from ITM as set values, it was observed that this resulted in the optimisation software discarding coal that was otherwise saleable, because the Optimiser was honouring the fixed limits exactly. Therefore, slightly out of spec material, that could not be blended, was being unnecessarily discarded. To mitigate this behaviour, the specifications of different coal products were expanded to include a range and penalties for being out of spec. This allowed the optimiser to blend different product standards to match marketing expectations. During the EO, this mechanism was simultaneously applied across all nine mines. This allowed the optimiser to blend material from all mines, within permissible logistics limits, to achieve optimum product specifications – maximising Net Cash Flow (NCF) and Net Present Value (NPV). The EO study also identified that ITM crushing plants and port capacities were bottlenecks in the system. Using Theory of Constraints (TOC), the optimisation process showed that operating both the crushing plants and port capacities for as early and long as possible could reduce bottlenecking. 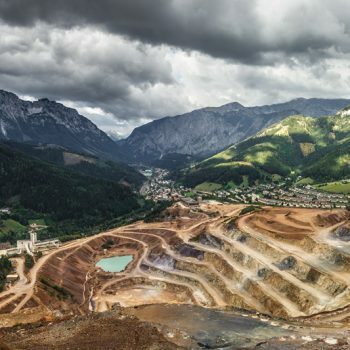 Mine scheduling constraints such as timing of permits, production smoothing and overburden removal produced a more practical, viable and economically superior mine plan for ITM. The NPV optimised case also illustrated the impact of new pit shapes, phase selection and scheduling which could be applied simultaneously across all nine mines. This indicated that current pit designs were potentially undervaluing material in the pits, which could be a significant source of untapped revenue. A two-phase approach to mining was recommended, where practical, to ensure better selectivity of higher value material and blending. The results of the Whittle Consulting Enterprise Optimisation study for ITM Coal Operations were financially significant. The study unified all available information into a single strategic business model, identifying important value opportunities for ITM. The integration of nine coal operations into one overarching model provided a holistic view of the business and a valuable strategic tool for future business planning. 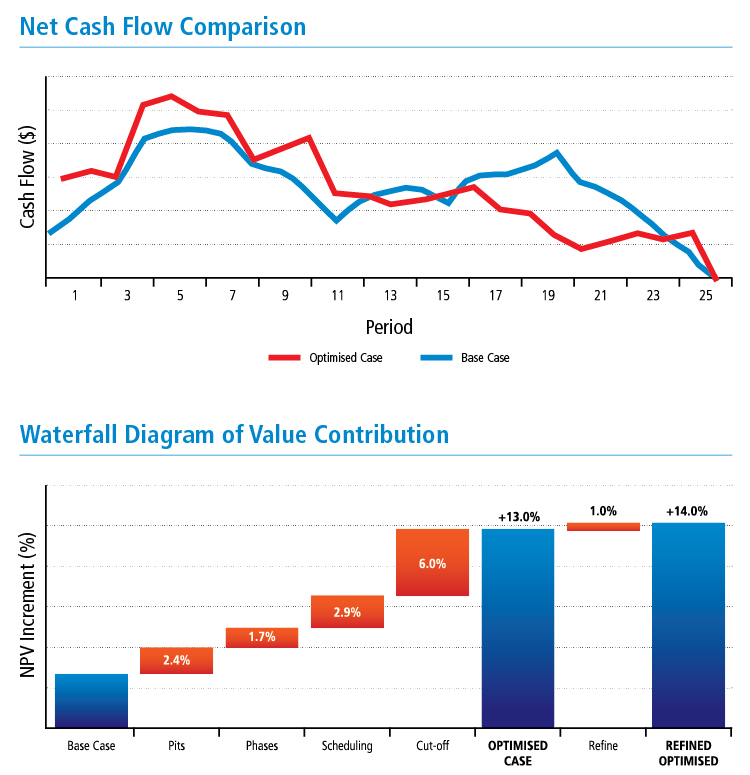 • Application of the Whittle Enterprise Optimisation methodology was able to pull cash flow forward, producing an initial net gain of 13% in NPV over the base case. • With further refinement of the optimised case, in collaboration with the client team, NPV could be increased by another 1% – resulting in an overall 14% increase. • Selecting the right material to mine in the pits should be based on its potential contribution to the project mix. Whilst this included a scalable CV value, Total Sulphur and moisture, it also looked at the overall system capacities and the best products to produce to maximise cash flow through the crushers and ports. • It was possible to break some of the large pits into smaller phases to enable the best value material to be brought forward, as well as enhancing blending. • Improving scheduling by having more discrete mining units, enabled better utilisation of the bottlenecks (i.e. ports). This resulted in having smaller overburden requirements to uncover coal resources, as well as permitting finer control over blending parameters. This outcome was counter to the industry paradigm of bigger is better and more efficient. • Being more selective with cut-off and what makes up product grade was advantageous. Not trying to sell everything that has a CV, was important as there is an opportunity cost in doing this. A preparedness to stockpile and even discard material, so that higher value products can be produced and sold, would bring cash flow forward.